Remember that TV show which helped singles meet the person of their dreams? Quirky and funny, The Dating Game was one of the most popular TV shows in the old days. If I remember correctly, The Dating Game was even franchised in different countries. Not much has changed in the face of dating in that people are still on their own quests to find their perfect match. If anything, dating has merged with technological developments, creating new options. Everyone knows about online dating and how it has become a viable alternative for many people. 3G Studios, a Reno, Nevada-based developer, has introduced a new element into the equation: a dating game that can be played with real people via social networks. Surprising? Not really. Silly? Probably. This new game raises a lot of questions, one of which is with regard to security. The developers deals with this issue by allowing avatars instead of photos. 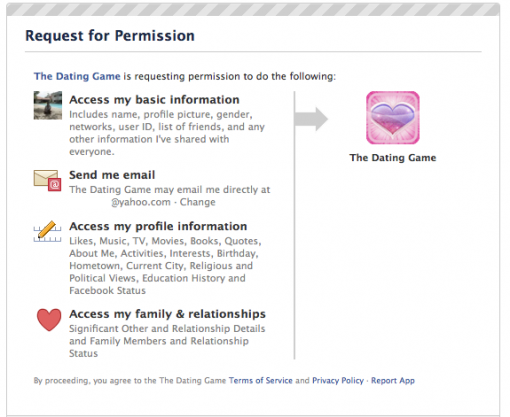 Personally, I think that if someone wants to play a dating game using his or her social networking account, then security would probably not be an issue for that person. Then again, if you take a look at that screenshot above, you might have second thoughts about playing the game. In any case, if you are single and you find yourself having nothing to do this weekend, grab The Dating Game for free. Or you can read a book. That’s probably more productive.